Sometimes we go to this place on Denman for pork belly, and we always get this soup when we go there. 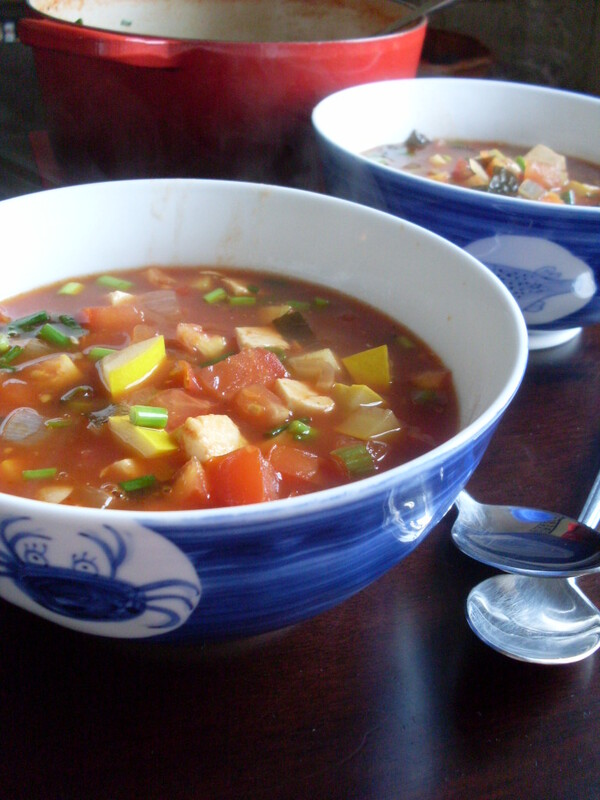 It’s a spicy tomato-based soup, and it’s nicely salty and filled with tomatoes and zucchini and chunks of tofu, and it doesn’t sound like much but it’s delicious. I would almost choose it over a table full of meat and beer, it’s that good. I don’t have the restaurant’s recipe for the soup, but it’s easy enough to interpret at home, with what we have in our cupboards. It’s also perfect for this time of year, when thunderstorms threaten our clear skies and the heat breaks, however briefly. It’s also very seasonal, and all of the ingredients will still be available well into fall. In a large, heavy-bottomed pot, sauté onions in oil until translucent. 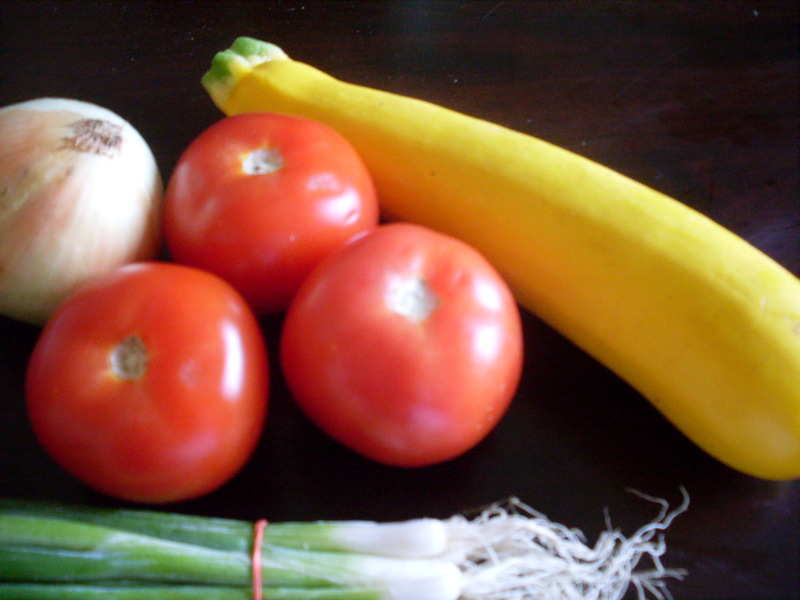 Add garlic, cooking until golden, then add zucchini, kelp (if using), tomato paste, and all six cups of stock or water. If you’re using stock, you may want to lessen the amount of soy and fish sauce you use, especially if your stock is very salty. Definitely start with less and add more to your own taste. I make this with water because of my unshakable cheapness, so I use more of the salty stuff to make it taste not like water. Add soy sauce, fish sauce, Sriracha, and lemon juice. Bring to a gentle boil over medium-high heat, then reduce to a simmer. 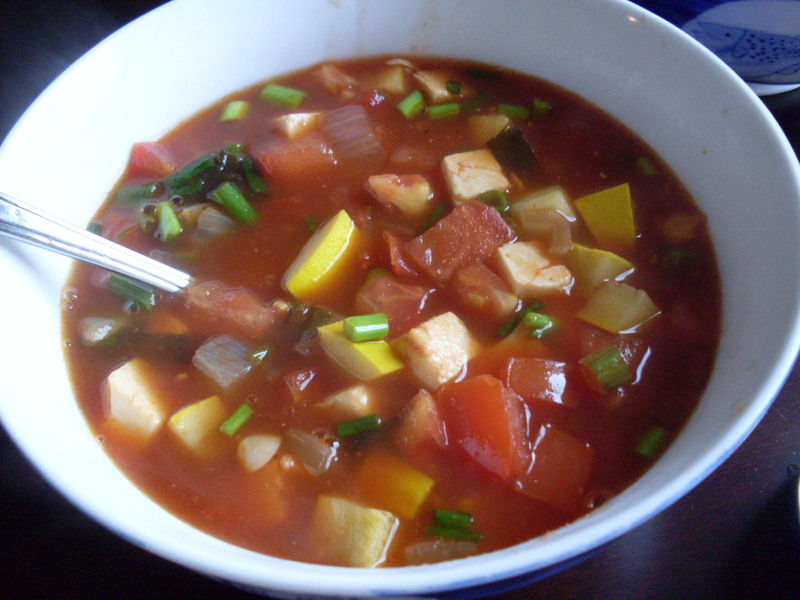 Add tomatoes, tofu, and scallions, and simmer for five to ten minutes, until scallions appear to have softened. Adjust seasonings as needed. Serve hot, with something cold, like beer, sake, or shochu. < Previous Blueberry crisp and a lot of procrastination. Next > Salt-crusted salmon with lime. This looks pretty good for soup in summer. And kind of crazy because it was crazy-hot in our apartment today and I made soup for dinner too. Weird. Giving up meat once a week is beneficial to your health and to the environment because it decreases your risk of chronic preventable conditions and it saves precious resources. That’s why I work for Meatless Monday. Many bloggers like to make weekly Meatless Monday posts featuring pictures or videos of meatless meals that they’ve made. If you’re interested in joining the Meatless Monday community and doing weekly Meatless Monday posts on Well Fed, Flat Broke, please email me at MeatlessMondayBlogs@gmail.com. Thanks! It was good! Very nicely spicy, which is perfect for this weather, even if it seems like all we should be eating is ice cream. My goodness, it’s muggy. Still. Also to note: My friend at work made this and added shrimp, and used nori instead of the kelp, and he said it was delicious. This is an amazing recipe, Smemily! I used dashi powder (for miso soup; the kind my mum gave to me is sans MSG) — a fishy enough ingredient so I didn’t use fish sauce? And I added soaked wakame at the end. Delicious spicy superhealthy costing pennies to make thumbs uppp!!! !